* When specifying players, make sure you use their names as it appears in the http://respawn.com.au/?page=events&a=players&event=55. Could I prebook K20 for Trogdor7620? Unfortunately you were beaten by the APB KR3W. Would you like anything else instead? Sorry! We're most likely going to remove row AA - so I have made it unbookable for now (if we do reinstate it for any reason, we'll move the booking back). I've moved you to row C 25-29 instead, but would you prefer somewhere else? All other seat bookings up to date! Could you please verify that all team members have prepaid? Some haven't even been registered, so I will temporarily hold this booking but please get this sorted ASAP. All other bookings locked in! Can I please book seats for Xequte & Rawful (prepaid). can you change it please? Can I please request that the SWOLE7 booking be changed from L16 - L18, to A23 - A29. Hey guys can I grab seats P15 - P18 for myself and 3 other friends? nintendojezz and I have already prepaid, as for the other two - they'll be under "gameman246" and "Major Ursa Bear (I think?)". I'll prepay for them once they've gone ahead and registered for the event but if the fact they haven't prepaid yet is an issue I'll gladly give up the seats if someone else wants them. Also, may I add BeanyBear for L21? kenny beat you to the punch. I've booked O16-O20 just in case. Would you like to select another spot instead? A17-18 already taken. I've put you in A9-A16. Is that ok? F28 already taken. Any other preference? Sorry, but everyone else beat you to the punch for a five seat run on row A. Is there anywhere else you'd like to sit? I've put you on row C just in case. P7-9 taken by VeNoM. I've put you on N7-N12 just in case - is there somewhere else you would prefer? Do you have plans for H29? Otherwise that seat may go to waste so we'd like to make sure it's still usable if we have a group or two (or more) people. Any objections to moving H28 to H29? Can I please book D1-D4 under the name "HUGH" and E1-E4 under the name "MUNGUS"
Yeah these seats are fine. Another friend has also just joined. Could we please add A8 for user "sinz"
Just pre-paid so I'm assuming I can book for my whole team. There will be 1 more to come, I will update as per these by tomorrow. Can we book seats D14-D18 for Pandajuice, Shaws, Rayne, Civicnox and Act under Insidious? 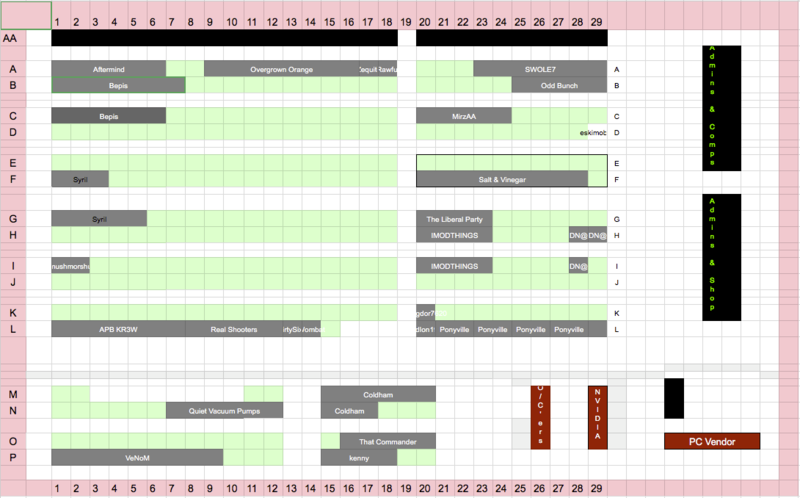 I've updated the bookings page. Thanks to everyone who has prepaid! Is it too late to prepay? I see it has already been updated in the live bookings. I would like to reserve the seat O - 12 for myself. Bugger, missed that post! Yes that's fine. Just saw above posts, if row is taken then N19-20, thanks! The website is stating we cannot book and its 7 months out!! 14/3/17 trying to pre-pay for October 2017 lan!! The website doesn't show the year on the front page, so that's referring to our 2016 event. We're taking a break while we find a suitable venue that's affordable and we'll let everyone know when we're back on!